Considering that this book was written nearly 50 years ago it has stood the test of time well. At 250 pages it is a slim volume and one that is easily digestible. It follows the format of many later books about the Somme by first exploring the events prior to 1916 before examining the reasons for the campaign, primarily to relieve pressure on the French at Verdun. Interwoven into this background is an introduction to the three commanders, Falkenhayn, Joffre, and Haig. The main focus then moves to the preparations for the campaign and the actions of the opening day of the battle. This is usefully split into sections, each looking at different areas of the battlefield from the northern diversion at Gommecourt down to the action south of the Somme where the British and French armies met. The following two weeks of the campaign are also dealt with in some detail but the remainder is skirted over quite quickly, with the Battle of Flers on 15th September being the only other action looked at in any depth. Farrar-Hockley believes that this was the last opportunity that the Allies had in making any breakthrough, the other opportunities being at Montauban on July 1st and at High Wood on July 14th. As an introduction to the campaign this is a useful book. It summarises the battles and units involved without becoming bogged down in too much detail. 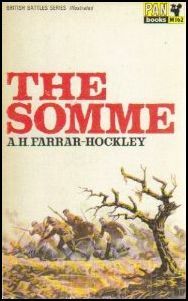 Analysis of the successes and failures are fairly balanced in perspective; bearing in mind it was first published three years after Alan Clark’s ‘The Donkeys’ and the year after ‘Oh, What a Lovely War!’ was first staged, Farrar-Hockley does not jump on the bandwagon and seek to vilify or denigrate those in command. He acknowledges the difficulties faced in the heat of battle (no doubt aided by his own experiences as a soldier in the Second World War and Korea), but does lay down some criticism of the way the campaign was run particularly where local opportunities and successes were not exploited. However as Farrar-Hockley asserts, “Time does not press upon us critics nor the burden of casualties” – something that any scholar of the war should keep in mind.